2019 repress. Subtitled: Experimental Guitar-Driven Tropical Sounds from Peru 1966-1976. In mid-50s Peru, mambo was progressively replaced by preferences for other rhythms like merengue, guaguancó, cha cha cha, joropo, guaracha, rumba and cumbia, which timidly begins to sound during these years. In Lima it's the golden age of great orchestras and music ensembles which are capable of playing swing and jazz, but especially the diverse tropical variants inundating the market. The most successful of all, La Sonora De Lucho Macedo, released in 1965 an LP consisting exclusively of cumbia. Around this time, the successful folklore group Los Pacharacos released the album Los Ídolos Del Pueblo, which included a cumbia number in the middle of the potpourri of huaynos, waltzes, and polkas. The groups preserved the fusion of fox trot and mambo rhythms along with huayno and cumbia in the execution of their music. That feeling would be the basis for the success of such unorthodox and unclassifiable songs as "La Chichera" or "Peti Pan". The recording in 1965 of these two songs by Los Demonios Del Mantaro on a seminal 45 with the Sono Radio label was the jumping off point for the birth of cumbia andina, also called "chichi" precisely for this song, which is dedicated to a vendor of the well-known Incan liquor. 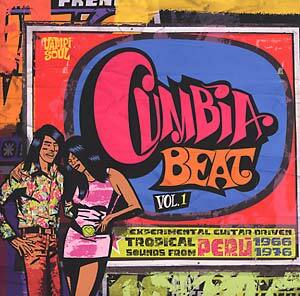 The electric shock of rock guitars enters the world of cumbia in 1968. The cause of such copulation was Enrique Delgado Montes, regarded as the genre's godfather. He did it, as part of his band Los Destellos, on a 45 and an eponymous 1968 LP (CAL 001LP/CALC 001LP). His songs constitute the most surprising musical fusions and amalgams of the time, whether they merge Cuban music and psychedelia, explore the sounds of Andean or Amazonian music, combine the digitalization of the Creole guitar with huayno melodies or abuse fuzz tones and distortion pedals. There wasn't an innovation that tropical guitarists didn't add to their sound: delay, fuzz tone, overdrive, wah-wah, reverb, modulating effects typical of rock bands are assimilated into a stunning sonic cocktail. In this context, cumbia reached the top of the charts in popularity. It replaced rock as the urban sound. Includes extensive liner notes in English and Spanish, photos, and memorabilia. Also features Silvestre Montez Y Sus Guantanameros, Los Orientales De Paramonga, Grupo Celeste, Los Mirlos, Manzanita Y Su Conjunto, Los Wembler's De Iquitos, Los Beltons, Los Beta 5, Los Galax, Aniceto Y Sus Fabulosos, Juaneco Y Su Combo, Los Sanders De Ñaña, Los Diablos Rojos, Los Ecos, and Los Demonios De Corocochay.